The link is to an article from a website titled “Enlightened-Consciousness.com” and talks about a BBC Documentary that attempts to show that during the ages of 13-29 Jesus traveled to Tibet and the surrounding regions and became a Buddhist monk. These are sometimes called the “silent years” because it is said that nothing is recorded in Biblical, Western or Middle eastern sources about the details of Jesus’ life during this time period. We will return to this claim later. The article also says that Jesus was tutored by Vedic scholars in the sacred Buddhist texts from the age of 13 to 29. It seems odd that Vedic scholars, those who study the Hindu Vedas, would be tutoring Jesus for 16 years in sacred Buddhist texts. The article goes on to say that Jesus didn’t die from crucifixion, returned to the regions of India, Afghanistan and Tibet and lived there until he was 80 years old. It is believed He is buried at the Roza Bal shrine at Srinagar in India-controlled Kashmir. That’s quite a difference in the age that Jesus died. Which is it, 80 years old or 120 years old? 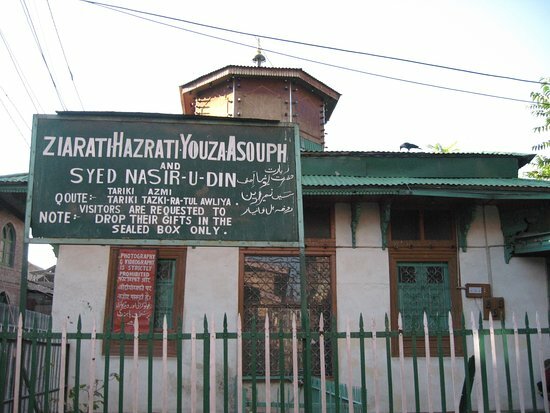 The Roza Bal or Rauza Bal or Rozabal is the name of a shrine located in the Khanyaar quarter in Downtown area of Srinagar in Kashmir. The word rauza means tomb, the word bal mean place. Locals believe a sage is buried here, Yuzasaf or Yuz Asaf (or Youza Asouph), alongside another Muslim holy man, Mir Sayyid Naseeruddin. The shrine was relatively unknown until the founder of the Ahmadiyya movement, Mirza Ghulam Ahmad, claimed in 1899 that it is actually the tomb of Jesus. This view is maintained by Ahmadis today, though it is rejected by the local Sunni caretakers of the shrine, one of whom said “the theory that Jesus is buried anywhere on the face of the earth is blasphemous to Islam. I don’t have time to delve into the Ahmadiyya sect of Islam here, but it has an interesting history and its adherents are considered “kafirs” or heretics by many Muslims. Mirza Ghulam Ahmad has written a book titled “Jesus in India“. They “seem to have been written”??? Let’s summarize what the Jesus is recorded to have said in these Buddhist documents as well as what Mr. Notovich wrote in his “Resume” section. These are damming things said against the religion of Hinduism attributed to Jesus who is supposed to have been a highly enlightened prophet. He also appears to speak negatively of being reborn as an animal. This not only speaks negatively against Hinduism but Buddhism as well. If people want to use this book to support the claim Jesus traveled to India and surrounding regions, they also need to use it to support the claim that in His HIGHLY ELIGHTENED state He believed many things taught in Hinduism to be false. At the age of 12 Jesus went back to Nazareth with his parents and was subject to them. Other translations say “obedient to them.” There is nothing to infer that he left Nazareth and went to India. Since Jesus had a custom of entering into the synagouge, this had to have been ongoing and it is reasonable to infer this had been going on during his time in Nazareth from the age of 12 to 29. Here read of Jesus again in His hometown of Nazareth and people in the synagogue saying “Isn’t this the carpenter?” They didn’t say “Isn’t this the carpenter’s son?“ They knew Jesus had taken up the trade of his father and worked in Nazareth until the start of His ministry. If Jesus supposedly left for India at a young age and had been away from Nazareth for about 17 years, upon His return it doesn’t make sense to then refer to Him as a carpenter. See below for videos that also deal with this subject. Below is a link to Part 1 of an EWTN Women of Grace broadcast on “Exposing the Truth About Mindfulness Meditation” that I happened upon recently. It peaked my interest because I like to study world religions, and had visited a Christian meditation group at a church in my area about a month before, and will relate my experience further down below in the post. “Mindfulness as a modern, Western practice is founded on modern vipassana, and the training of sati, which means “moment to moment awareness of present events”, but also “remembering to be aware of something”. It leads to insight into the true nature of reality, namely the three marks of existence, the impermanence of and the unsatisfactoriness of every conditioned thing that exists, and non-self. With this insight, the practitioner becomes a socalled Sotāpanna, a “stream-enterer”, the first stage on the path to liberation. Vipassana is practiced in tandem with samatha, and also plays a central role in other Buddhist traditions. Given this insight, one is on the path to self-liberation. Part of this understanding is the doctrine of anatta or non-self that states there is no unchanging, permanent self, soul or essence in living beings. The mistaken belief that we have a permanent self/soul keeps us embedded in the cycle of birth, death and rebirth or samsara. Hinduism parts ways with Buddhism by believing that there is a permanent self or soul. Right Mindfulness or Mindfulness meditation along with the other elements on the Eightfold Path are believed to help one eventually achieve nirvana. 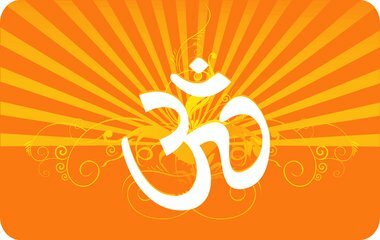 I have read that “AUM” is the unstruck sound that resonates throughout the universe, is pronounced as three syllables A-U-M, and being a mantra is meant to aid in concentration. This sounds very similar to the four syllable word “Ma-Ra-Na-Tha” suggested to be used in the Christian contemplative prayer groups. However, I don’t believe they would say that the word “Maranatha” has any spiritual power. Instead of repeating the word “Maranatha” I recited the 23rd Psalm because this seems more in line with what Scripture says in the way of meditation. It’s not an emptying of your mind to focus on the present or your breathing, but to focus on the Scripture or Word of God. It is not meant to come to the realization of non-self, but to draw your “self“, that is created in the image of God, closer to oneness with the Creator God of the Bible. The Contemplative prayer group started off with a woman striking a small bronze bowl three times, followed by a reading from a set curriculum. We then silently “meditated” or stilled and focused our mind for about 20 minutes. An older gentleman was sitting across from me on a cushion on the floor with his legs crossed. Another woman and I were sitting upright on a couch. The room was fairly dark with light coming through an open window, and there was an electronic candle on the table. It did have a kind of “Eastern” vibe or feeling to it. Afterwards I chatted with the gentleman for a little bit, and he mentioned a priest who lived in Japan who had syncretized Buddhist teaching with Catholicism. The gentleman didn’t seem to have an issue with this even though they contradict on certain beliefs such that both can’t be true, and have a totally different worldview and “end game” they are trying to reach. It was an interesting experience, but will I go again? No.